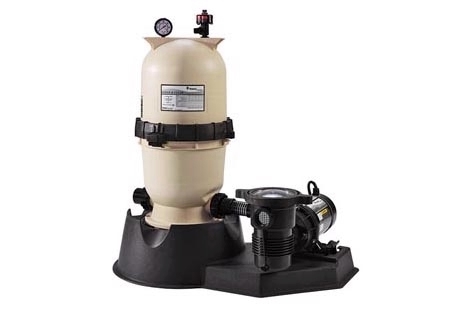 The DE filter is the most efficient type of pool filter on the market. It can trap particles down to 3-5 microns, well below that which the naked eye can see. DE filters use a pressure gauge to indicate a need for backwashing when it reads 8-10 lbs. higher than its clean reading. After backwashing a DE filter, a new application of DE filter powder is added to the filter by pouring into the skimmer. An annual breakdown of the filter is necessary to thoroughly clean DE filter grids. The powder is what does the filtering. A DE filter requires the operator to add DE powder to coat the filter grids inside of the filter tank. The powder dissolves in the pipe on its way to the filter tank. When it reaches the grids the powder stops, coating the grid. DE grids are also called elements or septums. As the water passes through the DE and enters the grid, it leaves the dirt trapped in the DE powder “cake” or coating. Do not operate your pump without having the DE powder coating the grids, or you will see your pressure rise very quickly. If left in this manner, the grids could become damaged. As the pressure gauge on a DE filter increases, flow rate decreases. Eventually the flow rate will allow the water quality to suffer. You will need to backwash the filter to remove the DE that is clogged up with the dirt. After backwashing thoroughly, add new DE powder to the filter through the skimmer. If you are using biguanides (Soft Swim or Baquacil), you will need to clean it thoroughly twice a year to prevent it from gumming up. Thorough cleaning is accomplished by turning the pump off and draining the filter, removing the tank top half and the grid assembly, and hosing the grid assembly thoroughly. If you want to do an extra good job, after hosing, soak the assembly in a trash can filled with water and a filter cleaner product (or use TSP (trisodium-phosphate) from the hardware store). Rinse thoroughly before reinstalling grids into tank. While cleaning the DE grids, it’s good to inspect them for tears and holes. Holes in your DE grids larger than 1/2 inch will need to be sewn or replaced. Inspect also for misaligned grids, and correct and check that the through bolts are tightly secured so that the assembly is drawn close and the grids are snug into the top manifold and the bottom spreader plate. When backwashing a DE filter, bump the filter several times. That is, backwash until water runs clear, move the multiport valve to FILTER and run it on filter for about 5-10 seconds, and backwash again until it runs clear.. Repeat this 2-4 times. Remember to always shut off the pump before turning your multiport valve or your push-pull valve. Each time you go through the cycle of filter/ backwash/ filter, you will get more dirt out of the filter, giving you a better, more thorough backwash. Be cautious not to pump DE wastewater directly into streams as it may choke small aquatic life. Your city or town may have discharge regulations for DE powder. If you are using a separate tank that separates the DE from the wastewater and returns clean water to the pool (prevents water wasting), it is especially recommended to bump the filter as described above and run your backwash cycle for a longer time period, maybe 10 minutes. Using a separate tank may also require more frequent manual cleaning of the DE grids because the backpressure reduces the overall flow rate during backwashing. For an effective backwashing, it is important to make sure skimmer baskets and pump baskets are clean to allow for full flow entering the filter. Have the Pool Expert clean your pool! Call us now at 602-859-8889!